So you’d like to obtain a mortgage to help buy your French property? That seems reasonable, especially as rates are so low. You might have heard that the lenders have tightened up their criteria since the 2010 banking crisis. It’s true they have, though things are more reasonable now. I’ve put together a little checklist on the mortgages available as of April 2015. You are tax resident in one of the following countries. You have an “expatriate / international” contract for an international company. You work on a Superyacht. Are you mortgageable? Points in your favour. The property is residential (ie non-commercial). If you are moving to France will you earning situation remain the same? Do you have a regular salaried income, on a permanent contract and are out of any trial period? If you are self employed or are a owner/director, do you have at least 3 years of accounts? Do you have cash that will cover the 15% deposit and the Notaires Fees and Stamp duty (so about 8%), so total cash of 23% of the purchase price. Points that counts against you. Don’t despair, these don’t always make the process impossible. Just harder! Businesses and small hotels (catered chalets). So f you are after a mortgage and you think you will qualify drop us a line here. This entry was posted in Advice and tagged alpine property, french mortgage on 2015/04/03 by Gareth Jefferies. Alpine Property is now a member of the France’s Estate Agency Confederation, La Fédération Nationale de l’Immobilier or FNAIM as it is generally known. Its logo, a yellow diamond, is often seen on the doors of the traditional French high street Agence Immobiliere. You can now see the logo on the welcome page of our website. So, why have we, an international internet based Estate Agency taken this step and why is our membership relevant to our clients? Estate Agency in France is a highly regulated and scrutinised profession. You can’t operate in France as an Estate Agen​t without the relevant licence. Once you have the relevant licence you must abide by a series of regulations or risk losing your licence, being fined or​,​ in rare cases​,​ sent to jail. Over the last 12 months the French government has passed a new law (the Loi Alur) which extends and strengthens these regulations. This new law has been passed to increase consumer​ protection against the actions of over zealous Estate Agents. As an example, when you sign a contract agreeing to sell your house through a particular Estate Agent you now have a 14 day period in which you can change your mind. Another example is that all properties must now be advertised inclusive of agency fees. In the past some unscrupulous agencies have advertised properties net of their fees. And just to complete the picture, a little more context but this time about the Estate Agencies themselves. Since the advent of the internet many new agencies are now starting up on​-line, just like Alpine Property. No bricks and mortar office, just a website. In itself this poses no problem for the consumer if the operation on the ground is professional and trustworthy. However, many of these new agencies have been using their virtual existence​,​ and loopholes in the old legislation​,​ to avoid its full impact and operate unprofessionally, to the detriment of clients, both buyers and sellers. We, at Alpine Property, have become increasingly aware of this issue through our clients and have been looking to support any initiative to curb the activities of such unscrupulous agencies. These new laws have been brought in to close the loopholes and prevent the rogue agencies from operating. They have been designed in collaboration with the FNAIM. This has been our first reason for joining the FNAIM​ – to support ​its work to make our profession more professional! The second reason we have joined this organisation is that as members of the FNAIM we receive information and training on changes in the law which ensures that our agents are fully ​up to date on of all aspects of the law covering property transactions. We hope that our membership of the FNAIM will assure our clients, both buyers and sellers​, of the continuing professionalism of Alpine Property​. This entry was posted in Advice, General and tagged alpine property, ALUR, FNAIM, Loi Alur on 2014/12/18 by Gareth Jefferies. La Comtesse development in St Gervais is, in our opinion a pretty good option for property hunters looking for something in and among it all. Set behind the church, right in the centre, owners will have a quiet location surrounded by trees and views of Mont Joly, yet with all amenities on their doorstep. In fact next door is the Sérac, a gastro restaurant that has recently obtained its first Michelin star, and very proud of them we are. Within a 100 paces of La Comtesse there’s a number of banks for all your international transfers, a few locals’ bars – La Grange where you’ll meet the lifties and ski instructors or the more recent Brasserie that offer a pool table and covers sporting events; the Serac’s gourmet bistort and deli; the Mairie for all your French admin or marrying needs and the little police station where the local ‘Policiers’, who get all excited if a car breaks down in the centre of the village and who double up for lollypop duty for the school kids, reside. Ahhh, sweet rural living. There’s also the choice of 3 supermarkets, the office de tourisme, the potters shop and the historic Haute Tour – which are fortified buildings dating back to the 13th century that can be visited and where cultural and artistic events take place. If you buy in La Comtesse, you can literally holiday in your slippers! La Comtesse is nearing completion and the other day, they had planted the trees which will give privacy and help landscape the newly implanted building. Only 6 apartments were ever available and there are currently only 4 left. We have just taken pictures of the insides of the apartments, which until now didn’t have bathrooms and kitchens. Yes, they still need their final clean, so you’ll spot dust on mirrors and floors and the odd ladder in the images, but have a look at the new mountain interiors with a modern twist. This entry was posted in Chalet Locations, new property, St Gervais and tagged alpine property, apartment, St Gervais on 2014/04/17 by gareth. Now we have to obtain energy ratings (DPE or Diagnostic de performance énergétique) for all the properties we sell we are shown the stark reality of the amount of energy homes in the Alps use. We know it’s not a cheap place to live but of course we have to heat our homes over the long winter and that is going to cost! Take a look at the following chart for the distribution of energy ratings across our properties. So most of our properties are D, E or F. I’m not sure that I’d buy a car or a fridge with a rating that bad, and of course our houses cost more to run than either of those! When I see a property with an A or B rating I’m generally sceptical, I always ask our agent how they managed a rating like that and I’ve had replies like “it’s unoccupied and they convinced the assessor that it doesn’t use any energy” or try this one, “it was an E but they got the assessor back and told him to do it again and it came back as a B!” so you can see why I am a sceptic. We’ve recently taken on a pretty little place in the Vallee Verte which has a “C” rating. As you can see even a “C” is hard to get. To give you an idea what you need to do to get a “C” we have asked the owner some fairly searching questions. He was happy to respond, not a big surprise as reducing his energy bill has been a labour of love. For comparisons sake, it houses a family of 3 in a fairly large house (4 bedrooms/168m2), is detached and at 1000m of altitude and is situated in the bottom of a valley that runs from North to South. Rain water and snow melt is collected from the roof in a 10,000 ltr tank. It is then filtered and used for everything. This is almost sufficient for the needs of a family of 3. The additional costs amount to 50€ but this is mainly the standing charge. The house is heated by two methods. An air-source heat pump and an 18kw wood burning stove. Air-source heat pumps are gaining ground on the ground-source systems (often referred to as geothermal heating) as they are less costly to fit and don’t require a large surface area of garden to bury the pipes. These air-source heating systems are a very efficient form of electric heating, you can in fact see the unit on the wall of the photo above. The house has Solar Panels fitted which supply energy to the grid. At current prices they provide about 1100 € of income. The domestic electricity bill (heating the house, hot water, lighting) comes to 1,500€ a year, so the net cost is 400€/year. So a saving of 2,800€ a year is certainly worth having! Probably 10% of the average family income around here. Even if you take the real consummation figure (so you’ll have to take off the income the Solar Panel provide) the savings are still huge (real consummation figure = 1830, so a saving over my house of 1710€). This entry was posted in Advice and tagged alpine property, DPE rating, eco chalet, lullin on 2014/03/18 by Gareth Jefferies. Liz Ockelton is married to Ed our Chatel agent. Liz has brought her professional training as a commercial and domestic interior designer in the UK over to France. She complements Ed’s work as an agent very well, so when he sells a property that needs some work then Liz is on hand to take on the job. From time to time we like to showcase her projects. Chalet Joyeux was purchased in Chatel in 2013 for 720,000€. The chalet was bought as a second home, the owners wanted a mountain retreat for the family. The aim of the project was to open up the main living space into one large open plan area and make it have more of a cozy chalet style. The open plan living area was really important for the family who want to spend time together on holiday. Upstairs the renovations created an en-suite shower room for the parents and a large family bathroom with bath for the children. Renovation costs – new kitchen and electrical appliances, 2 new bathrooms, all walls, floors and ceilings in the living space, lighting throughout, old wood interior doors. APPROX 80,000€ and then full furnishing throughout at an additional APPROX 40,000€. The design research works started in mid Oct when the chalet sale completed. The building works on site took 4 weeks start to finish. All finished in time for the Christmas holidays. All work was completed by local company Alpine Renovation, kitchen and bathroom and tiles all supplied by local suppliers. Opening up the living area has created a communal space for all the family. Below are a couple of pictures of the chalet kitchen in its original state. And below a before and after shot. A great example of how modernising a bathroom can in bring an old chalet into the current century! This entry was posted in Advice, Chalet Locations, Chatel and tagged alpine property, chalet renovation, chatel, liz ockelton, makespacedesigns on 2014/03/12 by Gareth Jefferies. We frequently get asked how much it will cost to build your own chalet. In general we quote 2500€/m2 as a benchmark. Sometimes we qualify this with “of course it depends on many many, factors”, such as the floor area, quality of materials and fixtures and fittings, easy of building on the site, proximity of services and things like that. But in the end 2500€/m2 is a good place to start. So if you were building a 4 bedroom 140m2 chalet then a starting point would be 350,000 € to build the chalet after you have bought the land. Everything costs more in the Alps. In particular materials and more importantly labour. We are not comparing like with like. The “average” chalet in the Alps is higher quality than a cheap house in the UK. The build methods in the Alps are more expensive. In general the properties have concrete basements and first floors. This makes a very solid property, sometimes due to earthquake and avalanche risks it’s mandatory to build this way. It’s also just “the way it’s done”, much like in the UK houses have traditionally been built from brick. There are various things you can do to reduce these costs. Taking each point one by one. I’m not going to suggest importing your materials from afar or even you labour (though both these things are possible and may save money). Building a cheap quality chalet is not a good idea, it would be a real shame to waste the worlds resources on building a house that won’t last. Build methods, there could be money saved here. It may also bring in points one and two. I’m referring to kit chalets. My neighbour is a carpenter and he has just built a chalet using mostly traditional techniques. The basement is concrete as are some of the first floor walls. The main frame was a kit though, the walls arrived on a lorry and ready built. He’s obviously building on a budget but doesn’t want to live in a cardboard box. His build costs will be well under 2000€/m2. We’ve recently been approached by a ECSUS Design, who have recently completed a chalet in Samoens and are constructing a couple more in Morzine this summer. These guys either design your home or adapt an existing design and fabricate using Structurally Insulated Panels (SIPs) that are precision engineered and cut to size to ensure an exceptionally quick method of building a highly thermally efficient chalet. The main weather-tight structure can be erected in as little as 3-4 weeks and can be easily finished by an adventurous self builder or they can do the entire job for you. The average costs of the SIPS structure is about 450€/m2 which represents about 30% of the overall costs of a new chalet and means that a fully managed build can come in at under 2000€/m2. Now I can’t act as a reference for these guys but they can offer references if interested. The company is http://www.ecsusdesign.com/ and the SIPs system is http://www.tek.kingspan.com/ They supplied me with the lovely photo of the finished chalet in Samoens. I have used it to illustrate this post. This entry was posted in Advice, General, Samoens, Uncategorized and tagged alpine property, construction costs in the alps, kit chalets, new build chalet on 2014/02/16 by Gareth Jefferies. I used to get asked this question twice a week. I think 2005/6 was the peak. Everyone wanted to move to the Alps, sometimes it was 1 in 4 of the enquiries we received . There was a lull in interest from 2008 to 2011 but the question is returning now. Not to the same level but maybe once a week. would be more appropriate. 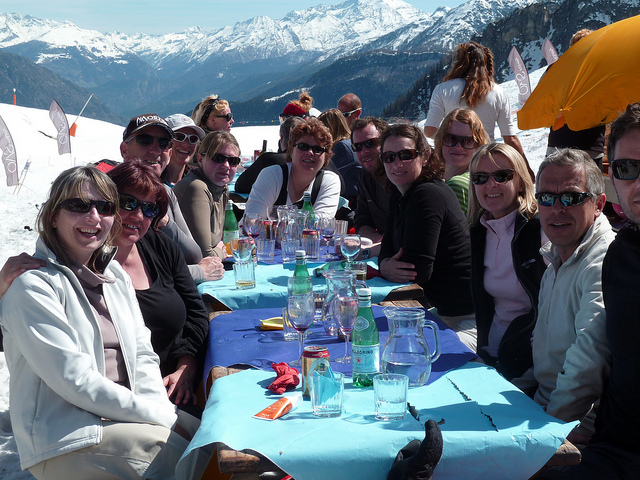 I think the reason that most people assume a Chalet Business is the way to do it is because most people that have gone skiing have witnessed at first hand a chalet business. The holiday cost them €800 so the embryonic business plan started over the dinner table. That sounds like a lot of money! There must be a margin there? Obviously you need a chalet or even better a small hotel, then there are the usual bills, food and linen to pay for too but surely there is a fair living to be made? And that’s not including the summer business. Right, sign me up, where do I start? Well I’ve been there. Now I earn my living from my full time job with Alpine Property I’ve also worked a couple of winter seasons, I did run a chalet business (mostly summer based) for 10 years and now I live in the Alps with my wife and 3 children. Surely living proof that it’s a good idea? Well “Yes” and “No”. I’m now going to give my advice. Feel free to take it with a pinch of salt! Accountants, #pilots, #lawyers, journalists, IT experts, various consultants and #project managers, guides (walking / biking / climbing), ski instructors, electricians, carpenters, plasterers, plumbers, builders, bankers (in Geneva), doctors, nurses, #engineers, estate agents, interior designers, graphic designers, photographers, artists, writers, teachers, taxi drivers, hotels owners and hospitality workers…. The professions marked as # generally work away from home and use the Alps as a base. There are bound to be more, these are just the ones I know personally. Even with the various jobs I have mentioned there are some fairly thorny issues that you need to take into account. Living in another country is the main one. Of course there is the language but that isn’t half of it. The French have a different attitude to life and this should not be forgotten. In fact it’s crucial. Before I came out I read “60m Frenchman can’t be wrong”. I read it but I didn’t really understand it. I’m still coming to terms with that 14 years later. I’ve three observations to make on this subject. 1. France loves rules. The French pretend they don’t. The state loves rules and regulations though and as far as a profession or job goes you would be well advised to find out about the rules and work within them. In contrast the UK seems to have no rules. Commerce seems to be something that anyone can try their hand at. Not so in France. 2. France is a socialist country. When labour governed in the UK (in my lifetime) they were only pretending to socialist. When Sarko was in charge in France he was only pretending to be right-wing. The fact is it costs a fortune to run a socialist country and this will need paying for. The cost of living in France seems high compared to the UK, everything costs more (almost everything) and everything in a ski resort costs more than that! It seems that in general the French are taxed considerably more that in the UK, this means that everyone needs to charge more to break even. 3. The French value their time off. Be that eating times or weekends. Never get between the French and lunch. An Anglo Saxon might find this funny but if you are French it’s deadly serious. It becomes before business. No question. So if you don’t feel that you can carry over your current skills and you still think running a chalet is the way forward then hang on! I’ll go on to explain some of the issues and pitfalls in the next post. PT 2, updated in Dec 2016. This entry was posted in Advice, Uncategorized and tagged alpine business, alpine chalet, alpine property, alps, chalet business, starting a business on 2014/01/16 by Gareth Jefferies. Les Rivières des Montagnes is a new development right next to the Grand Massif Express in Samoens. It’s a prime location that is hard to beat. 250m from the lift and a 5 minute walk from the centre of Samoens . In the summer it’s a great spot too, it’s next to the riverside path and only a short bike ride from the park and municipal swimming pool too. If you look at the map below you’ll clearly see the ski lift, swimming pool and edge of Samoens village centre. I’ve marked the plot in red too. We have one studio for sale 3 x 1 bedroom apartments, 3 x 2 bedroom apartments, 7 larger 2 bedroom apartments, one 3 bedroom and one 4 bedroom. I have listed them below. The new apartments are due to be completed by early summer 2015. That might sound like some way in the future but it’s not. Construction has just started. There will have to be a break for winter. It will restart again in the Spring of 2014, then the major works will have to be completed by the end of 2014, when you think that there are 17 apartments and a ski shop to build that’s a big job! The building will need to be watertight by the Christmas 2014 so the internal finishing can take place over the following winter for completion at the end of Spring 2015.
and the advertising sign erected on the site. This entry was posted in Chalet Locations, Latest News, new property, Samoens and tagged alpine property, apartment for sale, samoens on 2013/12/20 by Gareth Jefferies.